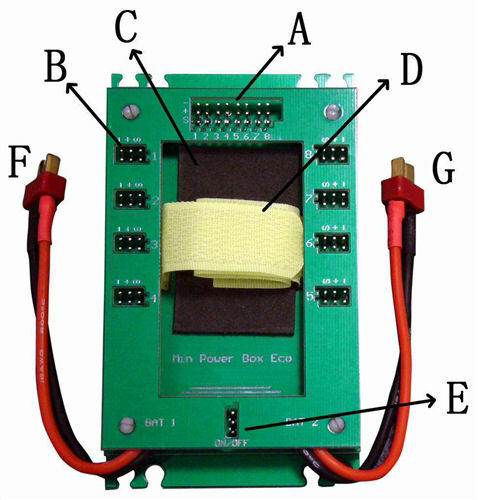 Why Use a Mini Servo Power Distribution Box? 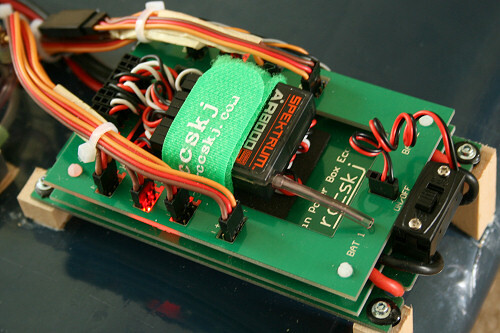 When using a large number of servos or a few high power digital servos the current needed to power these servos can be high, for example one single 16kg digital servo can draw up to 2.5A so you can see that it doesn't take many servos before very high current is needed to power all your servos. Receivers are not designed to handle such high current and you stand a real risk of damaging your receiver due to this high current and therefore loosing your large and expensive pride and joy. The Mini Servo Power Distribution Box routes the power needed by your servos away from your receiver and through it's printed circuit board which is designed to handle currents as high as 30A making your system a lot safer. The Mini Servo Power Distribution Box also allows you to use 2 separate batteries to power your receiver and servos giving you added safety should one battery fail while in flight. It also allows for a very neat installation of up to 16 servos, 2 servos per channel. Should the "ON/OFF" switch ail or become disconnected in flight, the system will fail to "ON"
Use 2 batteries to eliminate crashes should one battery become open circuit. The Power Box draws from both batteries. 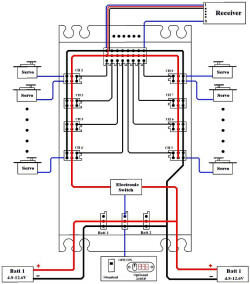 In event of switch failure, unit fails to "ON"
type, number of cells, capacity , and most importantly that they are the same voltage before connecting them both to the Servo Power Distribution Box as any differences can result in a large current transfer between the two batteries until their voltages become equal, this high current could damage either the wiring and/or the batteries themselves. Also be aware that what ever voltage you supply the unit with via "F" or "G" is the same voltage your receiver and servos will receive. 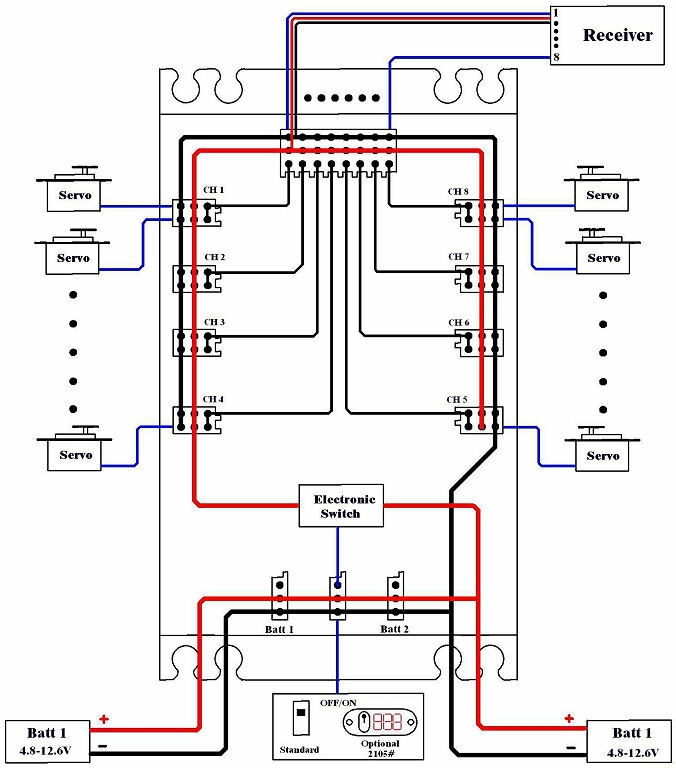 Make sure that both your receiver and servos will work at the input voltage.